Frank Boudreau (531st Squadron) sent in the following opportunity for his fellow 380th Bomb Group members. As a recent birthday gift from his grandson, Frank received a collage of himself and his friend Elmer T. Bryant, featuring pictures from their service years and reunion pictures through the present. Mike Aaron, a friend of Frank's family, made up the collage. Since Frank was so impressed with the picture, he thought a lot of the other members and their families might like something like this for a keepsake. 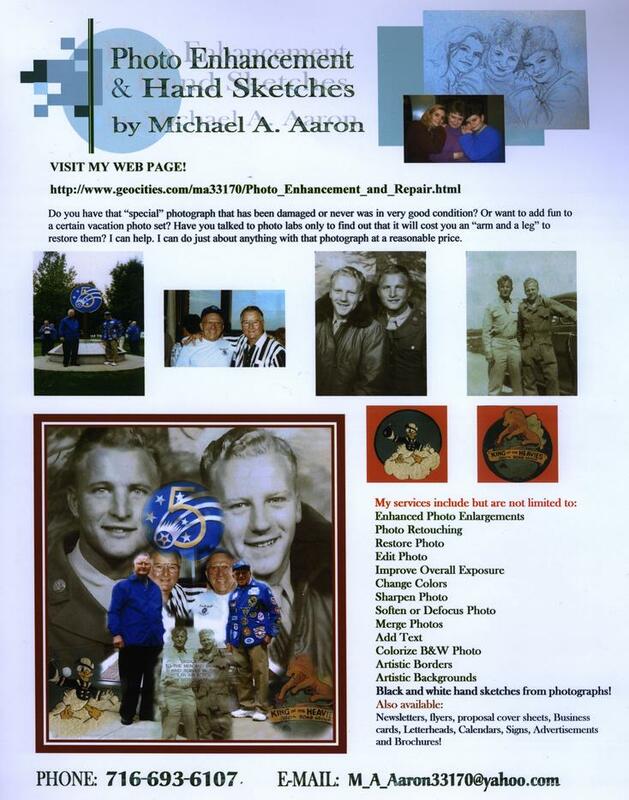 Mike Aaron's flyer follows, which shows a copy of the original pictures, the final collage in the lower left corner, and information if you are interested in pursuing this idea with your pictures.